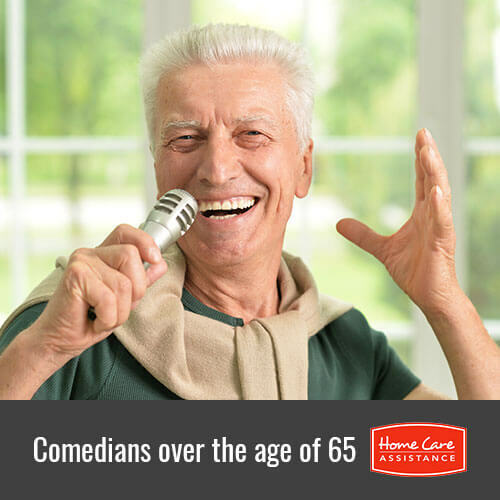 Thankfully, it is easy for seniors to laugh when they watch great comedians. In fact, many Oshkosh in-home care professionals recommend it to boost vitality. Many seniors can also draw inspiration for their daily lives from these five famous comedians and their hobbies. Caddyshack and No Respect are just two of the more famous movies in which Rodney Dangerfield performed. This actor was born on November 22, 1921 as Jacob Cohen. Amazingly, he did not start to act until he was over 40 years old. When he wasn’t working, he often could be found writing. After a thriving career, Dangerfield passed away on October 5, 2004. After being encouraged by her husband to try out for You Bet Your Life at the age of 37, Phyllis Diller had a long and successful career as a stand-up comedian. When she was not busy working, Phyllis enjoyed spending time with her family. Red Skelton was a weekly visitor in many homes that tuned in for the Red Skelton Show for over 20 years. His bit on the Pledge of Allegiance is still regularly featured on social media. Red was an insomniac who often slept for only two or three hours each night. In addition to writing comedy, he would get up very early to compose music. For over 11 seasons, many families had a standing date on Sunday nights to watch The Carol Burnett Show. When this comedian was not performing, she loved decorating her condos and homes in the latest styles. She also enjoyed fashion design. Lucille Ball’s I Love Lucy and its spin-off shows are still regularly viewed in many homes. When Ball was not having fun with sidekick and husband Desi Arnaz, she enjoyed gardening. She was the first woman to play a pregnant woman on television, the first to be involved in an interracial relationship and the first to own a television production studio. Seniors can draw inspiration from these comedians who worked until well after the age of 65. Encourage your senior to stay active and boost emotional wellbeing with help from Home Care Assistance. Our live-in and hourly caregivers in Oshkosh encourage seniors to lead active lives that promote vitality and longevity. Call (920) 710-2273 today to learn more about our services and how we can customize them to meet your loved one’s needs.